The Historic Pines Ranch is a Gorgeous ~ Vintage, Western Historical Site and Destination! Our ranch is the perfect location for Fun, Adventure-filled Family Reunions, Beautiful DIY Weddings or Special Events! We have 3 Incredible ceremony locations and many included items for Wedding guests. Our wholesome, family atmosphere promotes simplicity, relaxation and ease! Lodging for 38 guests as well as many other items are included in our affordable package rates! We are offering Single Cabin rates/stays several times this summer! If you aren't a large group and want a Fantastic Stay in one or two of our cabins with all the amenities of a resort then PLEASE Contact us for Details!! Lodging is available for the popular Westcliffe High Mountain Hay Fever Bluegrass Festival July 11 TO 14, 2019. This beautiful estate includes a commercial size kitchen, family sized cabins, amazing mountain scenery and plenty of great things to do! Rent our ranch and enjoy an exclusive stay on our 187 acres with private access to the San Isabel National Forest! The property offers a rustic theme hot tub and sauna room and the Outback picnic area is great for cook-outs, campfires or as a stunning Ceremony site! 3 Family Sized Cabins will ensure your comfort in a simple, charming ranch style. Linens, paper products, body soaps and courtesy coffee are provided in our lodging. Wedding package rates are offered and are different than the current rate showing. Please contact us for a wedding package quote. Our wedding guests enjoy such amenities as early check-in, included decorations, tables and chairs plus wine glasses, plates and silverware! Our Wedding Reception/Dance Hall (exclusive to wedding guests only) offers seating for 150 guests, a saloon and bar lounge plus upstairs prep room and access to our picnic area via gorgeous wooden decks! A private bride and groom “Honeymoon Cabin” is also included for Wedding night! Family Reunions enjoy the peace and quiet of our estate with many fun family activities! Onsite stocked fishing ponds, miles of hiking trails, wildlife viewing and scheduled trail rides (trail rides not included in rate) the ability to cook in our commercial kitchen or grill in the Outback Picnic area is up to you! Use our fire pit for s’mores for the whole family and wind down your day with fresh air and unforgettable memories! Whitewater rafting and ATV options are nearby. Vintage and Historical building dating back to 1898 are still onsite and tours are available in the “Old Lodge” by request. We REQUIRE that all stay be specified at request (family reunion, wedding package or single cabin) so we can adjust the rate to your specific need. Anonymous requests with no information will be denied. Bring your Family and Friends or Special Event for a Rustic, step back in time with a stay at our ranch! Please contact us for further information! We are happy to offer any assistance needed to ensure that your visit to our mountain retreat is a wonderful experience; just let us know how we can help! We apologize but we are unable to accommodate RV's, campers or tents. • The town of Westcliffe offers many fun summer activities:the annual Blue Grass Music Festival, Westcliffe Rodeo and Western Days, Plays in the Park, 4th of July Festival and Car Show and many other fun events. Keywords: Weddings, Family Reunions, Special events, Ranch, Rustic, Seclusion, horseback riding, hot tub, beautiful scenery, quiet, wildlife viewing, hiking, fishing, lakes nearby, guided hunting, private, cabins, National Forest access. My husband Dean has lived in this location for 31 years. He built all of the buildings and houses with the exception of an 1891 Montgomery Wards Kit home (which is still open for tours), for the purpose of sharing it with as many people as possible. It operated as a guest ranch from 1985 to 2010 with visitors from around the world that enjoyed the spectacular scenery, awesome horseback riding program and welcoming western atmosphere. While open as a guest ranch we offered 6 cabins that could accommodate up to 40 guests with full meal services and tours of the area. Now we are retired but still feel the urge to share this wonderful place with others and are happy to provide you the best the Sangre De Cristo Mountains and Wet Mountain Valley has to offer. Come enjoy our hidden getaway and endulge in your passion for a quiet mountain experience or take advantage of our beautiful location to host your wedding or special event! This area has some of the most spectacular scenery imaginable. It offers seclusion, comfortable lodging, unparalled quiet and access to over 2 million acres of mountain wilderness for hiking, riding, fishing, wildlife viewing and hunting. For Wedding Groups we offer all exclusive lodging and full access to our western style amenity buildings, ceremony locations and are happy to leave the details to you! An Amazing site for Weddings or Special events with a rustic, western style dance hall, on-site catering ability, 3 lovely ceremony sites ! Onsite Treasure Hunting for old Calvary Bulletts, Canon Balls and Indian Artifacts. Wildlife Viewing, Access with or without guiding to the San Isabel National Forest, Guided Hunting. Nearby Whitewater rafting and ATV Tours. Visit the fully restored 1892 Victorian house located onsite. All Bathrooms are full size with tubs/showers. Country/mountain setting surrounded by National Forest and open meadows. The Sangre de Cristo Mountains offer awe inspiring views! The Ranch is located at the base of Mt. Gibbs with sweeping scenery of the Sangre de Cristo Mtns. Mountains and the Wet Mountain Valley. Each unit of the Cusack's Cottage has a two burner stove top. No Ovens in either unit. Our commercial kitchen/dining room area provides cooking area for up to 150; seating in the dining room up to 65-70 guests. Outside patio porch with tables and chairs also available. Cusack's Cottage upstairs offers a small balcony with seating to enjoy the awesome views around the area! Cusack's Cottage features a large downstairs porch and small private porch upstairs. Foxtail cabin and Pinion Cabin also have large decks facing the southwest. All offer outstanding views of the mountains and valley. Foxtail Cabin is equipped with ramps instead of stairs upon entry and is limited to a single floor. National Forest Access, a fully restored 1892 Victorian Kit home to explore. Scenic outdoor grilling area. This is an Amazing Wedding Location! thanks so much we loved the ranch and your hospitality you are fantastic people . thanks again from Don Theresa and the boys. The scenery was great. I could sit on the doorstep of each cabin and look to the Sangre de Cristo's or to the Wet Mountains and feel like I had died and gone to heaven. It was great that we could walk up and connect to the Rainbow Trail from the ranch!!! Dean and Jodi were great hosts, very helpful. The cabins were very comfortable. Some of the members of my family felt that the setting was a little "rustic" for them, but I thought it was fun to experience a ranch in the high country. I WILL GO BACK AGAIN. Historic Pines Ranch offered us a fantastic holiday weekend! Everyone had a great time! Although the weather didn't cooperate everyone still was able to enjoy themselves. Our group was of all ages and everyone found something just right for them. We hiked, went to town, saw Bishops Castle, relaxed and enjoyed the ranch. Even the four-legged family members had a ball. Perfect weekend. We'll see you again soon. My family recently rented almost all the spaces for a long weekend to celebrate my youngest daughter's wedding. All of the bridal party and both sides of the immediate families were able to stay on site all weekend. That made it so easy. It was a truly a wonderful time. The nature of the place is easy going in a beautiful setting. Most of the cabins look out into the valley where sunrises and sunsets are gorgeous. The kitchen was well stocked. We had a cater come in and do all the cooking on site. Jodi was very open to letting us move things around in the dining hall to set up the room like we wanted and we returned it to the way we found it. The cabins were clean and simply furnished which was perfect for our family and friends, as most of us don't need a super upscale style place. Each cabin had a small frig, and some way to warm up food. The "old west" look of the ranch is fun and has its history as a guest ranch. There are trails that can be hiked and lots of room to wander around on. Jodi was available to answer questions at all times and took care of everything we needed. Their dogs were really friendly and made friends easily with our dog. The drive out from CO Springs is beautiful as well. It's just a lovely part of the planet to have fun and relax. Everyone thoroughly enjoyed this place and the wedding was just like we had hoped,... sweet, in a beautiful setting. Pretty easy to get things back "in shape" so the deposit is returned. Westcliffe is very friendly and only about 15 minutes from the ranch. If you are looking for a peaceful place to have a wedding or just chill out away from all forms of hustle and bustle for awhile, you might like Historic Pines Ranch. We sure did!! This is a lovely site for Weddings and we are happy to host them! We have many wonderful amenities and plenty of great options to make your special day one to cherish. The first wedding here on the property as far as we know, was in 1889 when the original owner of the Pines Ranch, Reginald Cusack married Gertrude Urqhart. Together they started hosting guests in their home, known today as the "Old Lodge", and the rest is history! We rented Cusack's Cottage and part of Pinon cabin for our wedding party. The place was set up perfectly for several couples and singles. Everyone had a private room and plenty of space. We loved sitting on the porch of the cottage in the mornings, the views are beautiful The Pines Ranch would be a perfect venue for a small wedding, reunion, or family get-together. Jodi was great to work with, we highly recommend it and would love to come back some day. 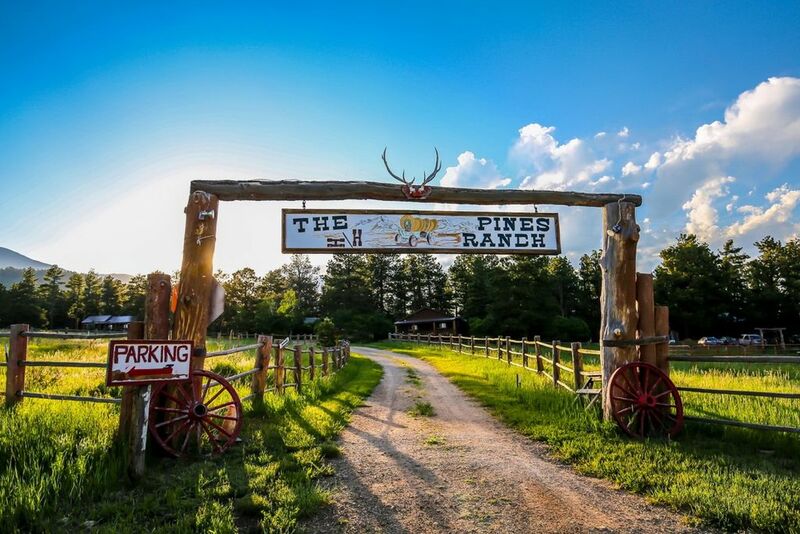 The Historic Pines Ranch has offered a wonderful welcoming atmosphere since the late 1800’s! The beautiful views and awesome mountains at our location are a “believe it when you see it” type of experience! Dean and I firmly respect tradition and enjoy meeting groups large or small. We love sharing our knowledge/history of the ranch and surrounding area with all who visit. This is a beautiful location for groups, reunions and small special events. We thank you for visiting us and we look forward to seeing you again soon! My two sisters and I spend a week together each year riding our horses and this year we chose the HPR as our location and were we pleased! Jodi and Dean are wonderful hosts and the accommodations are great. The cabins are comfortable, the views amazing and the trail access-OUTSTANDING. We rented the Pinion cabin and enjoyed our coffee each morning on the porch which provided amazing views of the Wet Mountains and the valley. We had direct access to the Rainbow trail via a beautiful single track trail . (Didn't have to hook up once to ride new trails) Our horses also enjoyed excellent accommodations in the form of a large pasture in front of our cabin. We enjoyed sitting on the porch watching them in the morning and evenings. The hot tub was delightful after a long day on the trail and if we wanted to head to town, it was an easy drive. We generally pick a different location for our trip every year but we all agreed that we would be coming back to the Pines ranch in the future. This is a GREAT location for summer time trail riding! Horses Welcome! Vacationers can enjoy everything from hiking to horseback riding to biking on the immense trail. Many side trails lead visitors up to mountain lakes and streams for fishing, picnicing and wildlife viewing. Our site offers a wonderful destination for Weddings and Special Events! We are located at the base of Mt. Gibbs in the Sangre de Cristo Mountains of Colorado and we back up to 2 million acres of National Wilderness area and Forest. Our Standard rate of $1333.33 per night applies to all stays with the exception of Wedding packages and any advertised stays such as the Bluegrass festival in July and Elopement packages. A Two night minimum stay required for wedding packages. Wedding package rates ARE Different than the current "Standard Rate showing. Please contact us for a Specific wedding package quote. There is a Three night minimum required for Family Reunion Packages - the current Standard Rate showing is our Family Reunion Package rate. We Require a $2500 refundable damage deposit by check two weeks ahead of arrival. Please contact us for a list of the numerous items we include! Wedding package rates are allowed a substantial discount on 3rd and 4th nights of stay! Contact us for details. We allow 150 guests on wedding day only. Onsite lodging is available for 38 guests. Family Reunion rates do Not include the use of our dance/reception hall. Elopement Packages are held to 20 or less people staying on-site and less than 40 on wedding day for discounted rate to apply. Weekdays are preferred Elopement package days. Some 1 night stays can be accommodated - please contact us for details. Elopement packages can be accommodated at almost any time during the weekdays from late May to the end of September. Single Cabin Rentals are available June 18th to 23rd, July 12th to 15th, 2018 and August 17th to August 28th, 2018. Contact us for Details! Stay July 12th to 15th and Enjoy the High Mountain Hay Fever Bluegrass Festival!